Cheers filled the small downtown Santa Barbara restaurant as Rep. Salud Carbajal (D-Santa Barbara) climbed a staircase to address the crowd just after he was projected to win California's 24th District for the U.S. House of Representatives for a second time on the Nov. 6 election night. 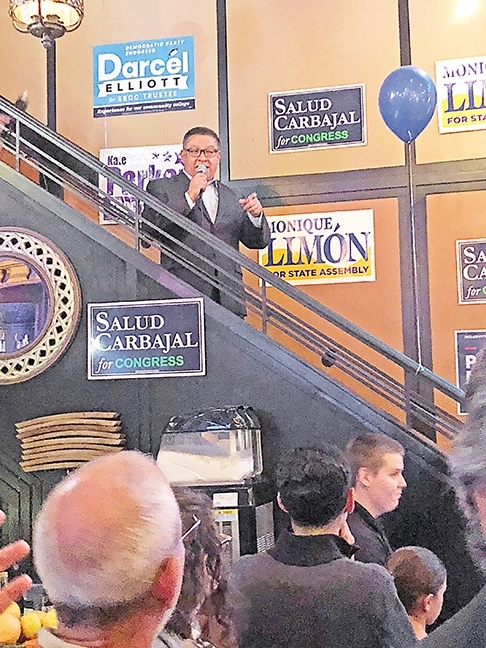 Supporters, Democratic Party organizers, and state and local representatives there had a lot to celebrate, Carbajal told the crowd, as their party won back a majority in the House from the Republican Party currently led by President Donald Trump. Rep. Salud Carbajal (D-Santa Barbara) spoke before supporters and Democratic Party organizers and representatives in Santa Barbara on election night, Nov. 6, thanking them for their support and votes that will return him to a second term in the U.S. House of Representatives. "What it means is that we finally have the tools and the checks and balance on an administration that has worked for the past two years to promote corruption and division instead of bringing us together," he said. "We finally have the tools ... to investigate, to ask questions, and to make things more transparent. This is going to be great for our country." According to results released on election night, Carbajal held his seat with more than 96,000 votes across the entire 24th District, which includes Santa Barbara and SLO counties as well as portions of Ventura County. Republican challenger Justin Fareed, a businessman from Santa Barbara, saw more than 75,000 Republicans turn out and vote for him across the entire district. At an election night party at the Far Western Tavern in Orcutt, Fareed addressed a crowd of supporters as early voting results showed Carbajal leading the 29-year-old in his second bid against the Democratic candidate. Fareed drove home his campaign points of "safety, security, and prosperity for our region" as he thanked supporters for making it out and watching the results come in. "We don't know what the returns are going to look like, but I do want you to know this, that it has been the honor of a lifetime to fight for you every single day," Fareed said. "It would be my privilege and honor to be able to fight for us in Washington, D.C., ... I just have to thank my family and friends from all over, from all walks of life, who have done so much to help us get to this point right here, right now." Across Santa Barbara County, the vote was split at 59 percent (52,612) for Carbajal and 40 percent (36,489) for Fareed, according to the county's semi-official election night results. Santa Barbara County's 1st District Supervisor Das Williams, who filled the supervisorial seat occupied by Carbajal after his Congressional bid, was at the party as well. Williams had been involved in "get out the vote" organizing since 5 a.m. that morning before a long Board of Supervisors hearing, he said, to help support Carbajal and local candidates. "It's crucial to protect our democracy, not just protect Democrats, but protect our democratic institutions," he said. "I think the national results mean that independents, especially independents in suburban districts, turned heavily against the Republican Party. I think it's not like super big science, it's not like they just like our ideas better, I think it boils down to they don't like people being so freakin' mean all the time and nasty." Carbajal made no mention of Fareed in his victory speech but instead kept his focus on congressional Republicans who he said have done "everything to undermine the Affordable Care Act." A Democratic majority will be able to protect health care, move forward comprehensive immigration reform, address climate change, and "do everything we can to maintain economic opportunity and jobs on our Central Coast," Carbajal said. 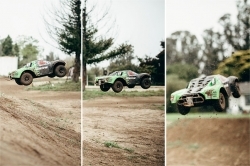 "We now are in a position where we can actually get things done," Carbajal said. "For the past two years we saw nothing but division, we didn't see much transparency, and we didn't see much things getting done. The few things that we saw getting done were for the wealthiest 1 percent in this country. "So it's high time we now start moving forward programs, legislation that take care of our working middle-class families," he added.